in this move wear this outfit. Of course I am using this in the play. I'm not sure which glass she is talking about though - if there was a window in the room she was staying in, or if it was the observation window in the locked door to her room, or what. I guess I'll have to decide pretty soon. Anyway, so I watched "Don't Bother to Knock" and it's not a bad movie. The plot revolves around Richard Widmark's character, a commercial pilot and his failing relationship with his girlfriend played by pre-Mrs. Robinson Anne Bancroft. She's dumping him because she feels he's too cold-hearted. So within an hour of being dumped, Widmark sees Monroe's character Nell in a window across the courtyard of the hotel they're at - Nell is babysitting for a couple at an awards ceremony at the hotel - and he goes for it - he invites himself over. It turns out that Nell is losing her marbles over her fiancee who died flying in the Pacific Theater of WWII. She thinks Widmark's pilot is her pilot. Anyway by the end Widmark prevents Nell from killing herself (with a razorblade rather than a piece of glass) and his girlfriend sees he's really a good guy and they get back together again. Could be worse. Monroe is quite touching when she really starts to lose it. She really could act. 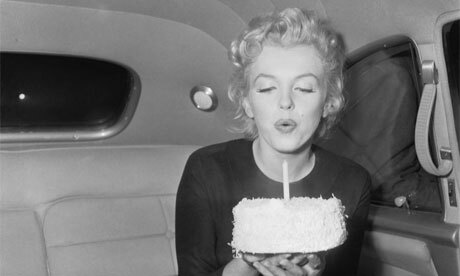 And today is Monroe's birthday, born in 1926.